While it may not be the most exciting topic, learning to throw a reliable, safe, and successful reset is something that is of critical importance to an offense’s effectiveness. Unfortunately, it is at times glossed over by coaches, captains, and teachers. Whether you are the most veteran of ultimate players or one of the newest rookies, learning some key tenets of dumps and resets, as well as reviewing and practicing the concepts laid out below, will help your consistency on the field and lower your team’s turnover rate. While it is vital that your team has an agreed-upon system to ensure safe movement of the disc backwards or to the middle of the field, it is also an individual responsibility to work the fundamentals and focus on making an appropriate throw. Practice makes perfect and the following 5 concepts will help ensure you and your team can maintain possession of the disc in any given situation with reliable resets. Good teams have a predetermined reset system with at least two — and preferably three to four — options for every thrower. In other words, everyone — from the person with the disc to the downfield cutters — will know a progression of looks and moves for moving the disc away when upfield, in-flow looks aren’t available. Whether this is a handler weave, a motion, or a recycle, give your team plenty of options for where to move the disc as the stall count advances. Enhance that progression by training several throws per option, so that a thrower can respond based on the mark and his or her own throwing preferences. For example, do not make your reset system based entirely on tight inside break throws if you may have players who struggle to break a difficult mark and complete this throw. This system gives five total throwing options and has the reset initiate by stall four, providing three different reset options before stall eight and a last-ditch option as well. Whatever system your team wants to use, it should be written down on paper and ideally diagrammed out for all players to have a copy of. It should then be practiced relentlessly, especially early in the year, to the point that the team does it instinctively. Combined with the other basics, a well-communicated, well-rehearsed, and well-coordinated system will allow your team to possess the disc extremely well. Even when you have a system that people know, it is nearly useless if throwers don’t consistently commit to it. Far too often, players get caught looking upfield too long and then throw casual or quick dumps without turning their body to face their target and stepping out into a throw — one of the biggest causes of turnovers on resets. This is largely a mental error caused by rushing a throw or failing to practice the proper mechanics and body language to execute the designed dump look. Change your field vision; by limiting yourself to only standing to look upfield, you give the mark and defense a definite advantage. When committing to the reset, turn to face the cut, using as much of your body to square up, shielding your throw from your mark using your hips and shoulders. Squaring up will help increase your focus and concentration, while also removing bad angles or difficulties in throwing into a tight space in a new direction. Especially useful for those who have trouble breaking a mark, pivoting to square up can give confidence and vastly increase consistency. Then, step out away from your mark, keeping your body square to the target, and making a good throw with spin. Ideal resets lose a minimal amount of yardage (or none at all) and move the disc laterally toward the middle of the field or the break side. In order to achieve this objective, the players making the respective reset cuts must be properly spaced. By maintaining a healthy distance from the thrower — between ten and twenty yards — a reset option sets themselves up to make a real cut with multiple spaces to attack for a thrower who has squared up, rather than relying on a single dive rescue reset. Collecting a reset two yards directly behind the throw does not change the angle of attack for the offense and puts throwers into an uncomfortable situation of trying to connect on a difficult short throw. The worst case scenario dumps usually are within five yards, forcing a thrower into a shovel pass that is difficult to cleanly catch. Instead, by spacing correctly, a reset has time to make a move to get open and avoid the scenario where a thrower is forced to throw a dump pass in the middle of a cut. If you have an opportunity to throw a reset earlier in the count, ideally before stall seven or eight, then take it! The later in the stall count you get, the more pressure to force a throw into a tight space. All that said, a reset doesn’t have to be pretty every time, as long as you hold on to the disc. If the team turns it over, perhaps forsaking the ugly dump for a downfield punt, you’ve lost possession and given your opponent a chance to score. Conversely, an ugly dump may put you in a bad spot to begin with, but position can be saved by a second throw to a secondary reset who has spaced properly. Communication is extremely important in almost all aspects of disc movement. You need to know where your next cut is coming from and who is going to be getting the reset. A well-practiced team has planned and rehearsed a pattern to make it easier to swing or dump the disc, but most reset-related turnover situations come when those systems either don’t exist or break down. The worst case scenarios are those moments of panic, when the stall is high, the defense has clamped down, and there seems to be no one available to throw to. Signal and be clear with what you as a thrower (or reset) want. For some, this is as easy as squaring up and making eye-contact. By turning completely sideways to stare down a player, you are usually giving a very strong hint that you want someone to cut for you. Similarly, a strong fake can indicate that the cut a reset has made isn’t open and they need to clear for the next option of the progression. Don’t underestimate the power of disc fakes to communicate. However, don’t be afraid to use your voice on the field! The offense’s greatest advantage is knowing where they want to go, while the defense must respond, generally a step late. When it matters, shout out the name of who you want and information about what you need. “Help!” can be a simple call to signal you want a dump to come at you, but you can be even more specific if you need to. Bottom line: be clear with what you want. The only thing worse than not having a dump because you didn’t communicate is having two or three players swarming around you in a panic because you didn’t signal clearly enough. One of the biggest reasons that even the most basic dumps result in turnovers is due to a lack of spin on the disc. Many players, especially those that transition to ultimate from other sports, have difficulty learning how to complete an accurate, catchable pass in a tight space or over a short distance. They often spend most of their time practicing throwing to traditional in-cuts or other flat, straight, mid-distance targets. More often than not, they do not practice turning to throw backwards or in a tight area that is close to their body. What happens most often on these short resets is a quick flip more like an underhand ball pass than anything else. Without spin on the disc, it will flutter, go off-target, and fall to the ground incomplete. Like anything else, you must practice those tight spaced throws that are sometimes necessary to hold on to possession. First, put energy and focus into the throw. Look at the target, throw to where the target is going to be (not where he or she is at the moment), and make a real throw, not just a soft toss or flip. Preferably, that throw should be a backhand on anything under five yards, as forehand dumps are often inaccurate, come in too fast, or catch handlers by surprise; it is very hard to put the right amount of spin and touch with a close forehand. But even if the handler or reset is very close to the thrower, spin is needed. Work on tossing with a friend, circling each other in very short distances. Try to put as much spin on the throw as you normally would, while still providing touch and accuracy to make it an easy one to catch. Although it may not be glamorous, thinking about dumps, resets, and swings, as well as talking about them and practicing them with a team, is extremely beneficial. 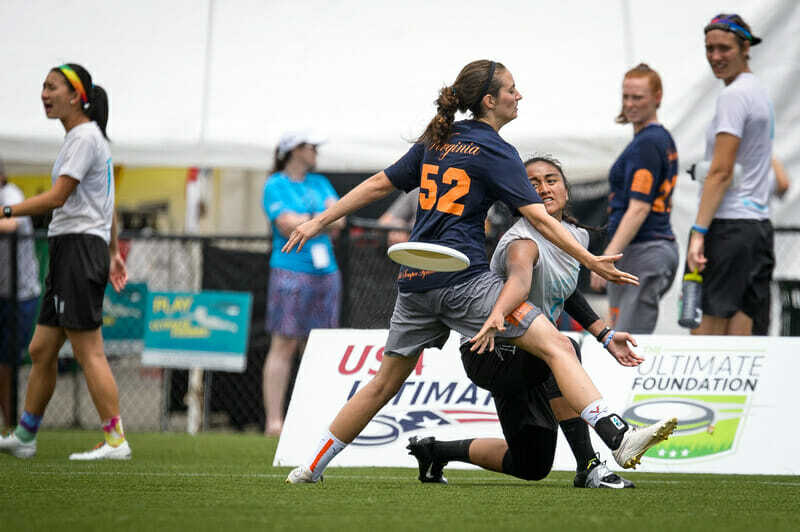 The team that turns the disc over the least in ultimate will always win, and one of the key ways to limit turnovers is to be patient and to get the disc into the hands of the best throwers, especially in difficult situations. Work hard and see the success those resets will bring. Comments on "Tuesday Tips: 5 Steps To Throwing A Reliable Reset, Presented By Spin Ultimate"